The Geneva Summit of 1985 was a meeting in Geneva, Switzerland. It was held on November 19 and 20, 1985. It was between U.S. president Ronald Reagan and Soviet General Secretary Mikhail Gorbachev. The two leaders met for the first time. 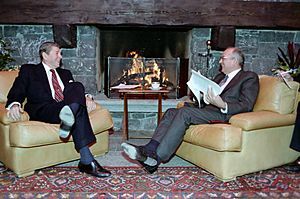 They met to hold talks about not to use nuclear weapons and to seek a partnership between the United States and the Soviet Union. Geneva Summit (1985) Facts for Kids. Kiddle Encyclopedia.